At this point I thought I had started a sufficient variety of threads to give everyone something to which to respond. Then Ed read through them and exclaimed, “What? No sports thread? You have to include a sports thread!” Personally, I think he just wants an opportunity to mention – once again – that the Clear Creek Wildcats beat the Milby hoopsters in 1957, especially since he was one of the Wildcats playing in that game. So, what would be your choice as the most exciting (or disappointing, if you want to go in that direction) sports event while we were at Milby? Perhaps you played in that game, or maybe you participated in such a game as an enthusiastic spectator, a member of the band, a Coed Cadet, a Bisonette, a cheerleader, etc. Give us your thoughts on this. While we are on the topic of sports, what teams do you support now? Any coaches in our midst? (or retired coaches?) Ed was a high school administrator for years, so I have supported my share of teams in places where we have lived over the years – Houston, Indiana, and Wyoming. I am now an enthusiastic Baylor fan as we live in Waco and have many Baylor graduates in our family. But I find myself following local little league sports even more enthusiastically, as I attend all of my grandsons’ sports activities. How about you? There are lots of fond memories of being in the band & orchestra. Those wool uniforms sure were hot, though. The "adventure" that stands out was marching in a parade in Corpus...behind horses & well...let's just say we did lots of side steps. :) Also enjoyed playing poker with toothpicks on the bus trips to ball games. Undoubtedly the most disappointing sports event for me was the one point loss to Pampa for the 1959 state basketball championship tournament held in Austin. Although only the semi-final game, it was touted as the championship game by many. Who can forget Alton Adams. What a team that was. Remember the Pep Band. It was the only one of it's kind. We traveled to Austin, gold shirts and all, only to be told we couldn't play during the games. Too much noise, they said! Well, some called it noise! Charles, your thoughts about the Pampa game bought back memories of going to the game. My best buddy (and he remains so to this day), Rodney Preuit came to me at home room the day of the game and asked if I wanted to ride to the game with him and Edward Neveau (?spelling?). I called my parents to get permission, then borrowed $2 from someone and we left straight from School for the drive to Austin. I paid my share of the gasoline and had enough money to buy my dinner on the way to the game and a coke at the game, all for that $2. We got back home about 3AM the next morning. Aside from the late hour, after losing by one point, the ride home was very quiet. When I went off to UT - Austin in 1960. I never could go inside Gregory Gymnasium without hearing the noise and feeling the disappointment from that game. Jumping ahead 48 years, my best bud Rodney and I are going on our first boys only field trip since when we fly to Seattle for four days this coming August. This is great Karla, I can not thank you enough for this venue. Good afternoon Ray, I missed that game but I remember that name Rodney Pruitt and so many more that I am seeing here on this blog ( by the way this is my 1st experience with a blog as well, Billie ). I am going to leave this page and go to the memory page and enter some more cooler stuff. Hey Ray, tell Rodney hi for me! ! ! What wonderful memories this brings to mind ! ! Well, I went to that game too. I was so upset and felt so sorry for the guys. Remember we were given a penalty because someone (they said a Milby person) threw something on the floor)...now how could you know that when people were packed to the rafters. I was going out with Steve Dowling at the time so it made it even harder to see them so down. People started talkin' back and forth in the parking lot and Richard Carlton made me hush before they ended up having to defend us. I went with Sandy Payne and we stayed, with her Mom, in the Driskoll Hotel. Too fine!!! I know Karla through her husband, Clear Creek alumnus Ed Davis, and have met her only once after a Baylor baseball game. I have no memory of Milby's state tournament game that y'all talk about because Clear Creek, after three straight years, was not there that season. 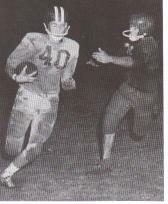 It was Ed's senior year and we lost in the regional finals before going back to Austin the next four years and finally winning a state championship in 1963. Clear Creek, Class 2A at the time, had some good tussles with Class 4A Milby. Some may remember that the two schools, now both 5A, met in the playoffs year before last. I, like Ed, am married to a Buffalo gal (Class of 1963) and I asked her who she wanted to win. She said she didn't care. There may be other Buffalo gals from her era that also did not care by then. Note the picture of Mrs. Robinson's piano players all happy and smiling before their big recital, except for me in the back row with a look of abject terror on my face. I could not remember the Toredor Song and sure enough, when the time came to perform, I froze, humiliation filled every pore and I slinked off the stage a broken soul, never to play the piano again. I still have that picture in an old album and every now and then it comes out and my feelings of humilitation return although not as obvious to the casual observer. Welcome to the Blog, Joe!!! Perhaps you have visited before, but it is so good to hear your e-voice here. I think you are making remarkable progress, that you can actually put your story of humiliation out there for the world to hear. I wonder what a psychologist would make of the fact that it did appear as a comment on the sports thread. ;-} Did you catch your photo as a cheerleader in the Deady album? Hello, I attend Milby High!!! I have tons of pride for my school!! I'm part of the softball and cheerleading team. Our fields don't look so nice and our track doesn't even look like a track. The people who are in sports try to do the best they can to win games and we do win some games, but I know everyone is capable of more. Milby coaches try their hardest to make the teams advance, but they can only do with what is there. For example, the football coach really believes in his team, and does all he can to better his team's future. He stops at no limit to help "his boys", even if it means money from his own pocket. I would like some advice on what can be done to help Milby's sports and future students of Milby High. Some students from Milby don't have the pride that I do, and I want them to be proud of attending this great school. How can I change people's minds? Sorry for the inconvenient message. I think it is exciting, not inconvenient, to have a current student on this blog. Maybe people more involved in sports than I will have some answers for you. Thanks!!! !It really means a whole lot. I also want to know about the activities that yall would do when yall attended MILBY. What did yall do for spirit day, or rallies? Things like that.I want to bring back all the exiting things. I don't know if things have changed that much. I remember when my older son came home from a pep rally at Round Rock High School. He said the Round Rock cheerleaders had announced that the cheerleaders from the opposing school would make an appearance. "Oh," I said, "and the Round Rock football players were dressed up like the Westwood cheerleader, right?" "How did you know?" he asked. I replied, "I went to high school myself."